What&apos;s a guitar without strings?! Whether you&apos;re playing soft jazz or doom metal, chances are you will be needing a new set of strings at some point. Thankfully, we have a huge range of guitar strings available to buy online or from our store here in Poole, Dorset. 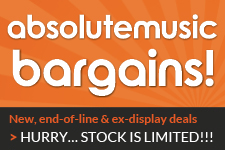 If you are looking to stock up, just in case, or need to restring a few guitars then have a look at our guitar string multibuy deals and get yourself a bargain! Whatever gauge or material of string you are after for acoustic, electric or bass guitar, we are sure to have something for you from brands such as Ernie Ball, D&apos;Addario, Picato, Elixir, Fender and Martin. We are very proud of our stock of guitar strings and we try to keep them at the best possible price, so if you find them cheaper anywhere else in the UK just let us know via our price match request form. You can buy guitar strings from us in full confidence knowing that we are a Google Certified Shop and have a huge stack of glowing reviews on Feefo.